“Takashimizu” was selected among 5,037 ideas from the public soon after the end of World WarⅡ in 1947. Our company was founded in 1944 after merging of 12 small breweries on the ground of the act for industrial adjustment and serious shortage of material rice. Each brewery gave up their own brand name to strengthen this bond between 12 breweries and invited ideas for new brand name from the public. Takashimizu literally means “high spring water”. In Akita city, there is an area called “Takashimizu hill” which is famous for a lot of spring water, and there is also still a sacred fountain called “Takashimizu”. This fountain is well known as limpid water. Our Takashimizu brewery is also located in a place famous as a source of the purest water since Edo period and we always use good quality water for sake brewing. 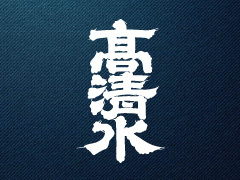 There are meanings behind our brand name Takashimizu, “harmony” built by founders through getting over hardship and “quality first” practiced by good quality water, rice, and high level skills of brewing. To delight customers, Toji pours his ardor. Using only rice and water. Feel the quality of ingredients and the skill of Toji.